The definition of beer based on the food codex explains the complete process of making beer. First; barley malt, malt and extract substances are grinded together, then processed with hot water. Hops are added next, boiled, cooled and left for fermentation. The final product may or may not be filtered and pastorized yielding a drink called beer, that is either clear or blurred. Beer has been through a long history that is about 9 or 10 thousand years old before reaching this definition. Barley and wheat has been the main staple in the near east regions, however for the most part wheat was in the limelight whereas barley, the raw material of beer, was in the background. However barley was also as old and effective as wheat in the part it played in the development of civilizations. The first place barley was grown and cultivated is, the southwest of the ‘prosperous crescent’ region, in other words, the general region of Syria, Israel and Jordan. 10,000 – 12,000 Years ago, barley traveled to souteast Anatolia, Iran and then continued to China via Afghanistan, Himalayas and Tibet. The archeobotanic findings in the souteast part of Anatolia also backs up this theory. Hordeum vulgare, in other words barley, was always grown in the the same geography and appeared in the same cultures as wheat, however it was never used in bread making as wheat. Barley was mainly used for making beer, soups, meat stews, tea or feedcrop for sick people and people who are confined to bed. The history of beer goes back before the written times, because of this reason it would be impossible to think of beer independantly of barley. Mesopotamia, and Anatolian civilizations have always produced beer from barley, therefore these near east cultures are considered as the inventors of beer. 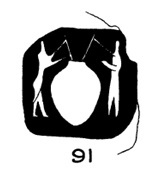 On various different seals, the similar scene of a person drinking something with a pipe sitting in front of a jug with a broad opening, narrow neck and a wide body was always associated with drinking an alcoholic beverage and especially beer. Then one can question, how can we know that these special jugs contain an alcoholic beverage or beer? The answer can clearly be seen in the Sumerian pictograms. The word for beer is symbolized with the pictogram of a jug with a broad opening, narrow neck and a wide body. 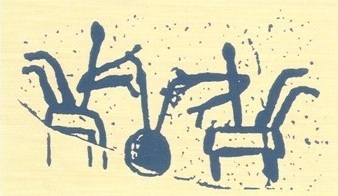 The Sumerian pictogram that symbolizes the word for beer. A portrayal of beer jug in Boğazköy. Beer today is produced by malt that has been sprouted from barley and mixed with hops and fermented. 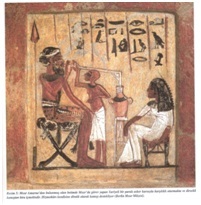 However in ancient civilizations such as Hitites, Egyptians or Mesapotamians, the production of beer is made with a different method. The first thing we have to know is that hops (Humulus lupulus) either did not exist in that time period or it wasn’t used in beer-making. Barley was not the only grain used in making beer, millet or wheat was used as well. During this production, malt was produced using the classical methods, and then roasted or dried in order to stop the sprouting. Hitites called this product tepšu- meaning “dry” or “a grain that cannot sprout” and haššatar NU.GÁL “infertile” or “grain that does not have ability to sprout”. [v] These roasted malts, were used whenever needed, by pounding into a powder form, mixed with water and left for fermentation. Therefore whether its the Hitites or any of the neareast civilizations, all the beer made, resembled an unstrained thick drink with soupy consistency and sediments. Therefore using a straw was necessary to drink it. In conclusion, in Anatolian, Mesapotamian and Egyptin civilizations, barley was used in making a highly nutritious drink – beer – and not in making bread. It is clear that the beer from those time periods were unlike the beer consumed today. It did not contain gas, have barley malt sediments, therefore drank with straws made from lead or wood and was low in alcoholic content. Homer also mentioned the nutritious aspects of a drink made from malt. This drink is called kykeon, which literally means batter or a thick drink. It is important to take a look at the passage below from Illiad, Homer’s eternal work, to see how he explained kykeon. “…Hekameda, with her beautiful hair made them kykeon. The old man had brought Hekamede from Tenedos. Hekamede first pulled the table in front of her. A dark, shiny, polished table. She placed an onion and a bronze plate filled with golden honey, on the table. Then arrived the holy barley flour. The woman prepared kykeon for them using Pramnos wine. In it she grated goat’s milk cheese, sprinkled barley flour, and when kykeon was ready invited them…”[viii] Although until today nobody knows exactly what kykeon is, researchers have come up with ideas and even tried to make it. The only trials that were quite successful were Dalby and Grainger’s trials. These two researchers, have used roasted and grounded barley flour, heating it with wine, honey and goat cheese and made a food that looked like a batter. [ix] However it would be a correct assumption to look for the roots of kykeon in barley malt. In summary, beer has been produced for about 10.000 years, ever since the humans have been domesticating grains. Beer making is closely related and has an important place in the neareast cultures. Even though in the later years beer was replaced first with wine and then with distilled drinks, beer has created its own culture and holds an important place until today. [i] A.Ünal, Multilinguales Handwörterbuch Des Hethitischen-A Concise Multilingual Hittite Dictionary-Hititçe Çok Dilli El Sözlüğü, Verlag Dr.Kova?, Hamburg-2007, 625. It is important to mention here that the word for barley in Hitite language is ŠE and halki- however ŠE also means seed or piece; halki- is generally used for of grains. Please also refer; H.Ertem, Boğazköy Metinlerine Göre Hititler Devri Anadolu’sunun Florası, TTK Yay., Ankara-1974, 4-5. [ii] A.Ünal, “Erken Anadolu Toplumlarında Günlük Yaşamda ve Kült Yaşamında Bira”, Uluburun Gemisi-3000 Yıl Önce Dünya Ticareti, (edt.) Ü.Yalçın-C.Pulak&R.Slotta, Ege Yay., İstanbul-2006, 169-172; S.Alp, Hititler’de Şarkı, Müzik ve Dans Hitit Çağı’nda Anadolu’da Üzüm ve Şarap, Kavaklıdere Kültür Yay., Ankara-1999, 67. [iii] V.Müller-Karpe, “Anadolu’da Bronz Çağı’nda Bira”, Uluburun Gemisi-3000 Yıl Önce Dünya Ticareti, (edt.) Ü.Yalçın-C.Pulak&R.Slotta, Ege Yay., İstanbul-2006, 173-186. [iv] E.Uzunoğlu, “Fragment eines Bemalten Gefässes Mıt Libationsdarstellung aus Imamoğlu-Höyük bei Malatya”, Anatolia and the Ancient Near East-Studies in Honor of Tahsin Özgüç, (edt. )K.Emre-B.Hrouda-M.Mellink-N.Özgüç, TTK, Ankara-1989, 497-503;, pl.138/2. [v] A.Albayrak-Ü.Solak-A.Uhri, Deneysel Bir Arkeoloji Çalışması Olarak Hitit Mutfağı, Metro Kültür Yay., İstanbul-2008, 87. [vi] Ünal 2006, s.169-172; Albayrak-Solak-Uhri 2008, 88. [vii] For detailed information please refer to; V.Müller-Karpe, “Kuşaklı-Sarissa’da Büyük Tapınağın Bira İmalathanesi”, V.Uluslararası Hititoloji Kongresi Bildirileri, Ankara-2005, 555-574. [viii] Homeros, Iliada 11.kitap 625-640. [ix] A.Dalby-S.Grainger, Antik Çağ Yemekleri ve Yemek Kültürü, Çev.B.Avunç, Homer Yay., İstanbul-2001, 40-41.